Despite being not a bicycle-friendly city, there are more than enough cyclists in Tokyo, which means that there are many bicycles here with little space to park them. So around the bigger train stations there are dedicated areas for bicycle parking. 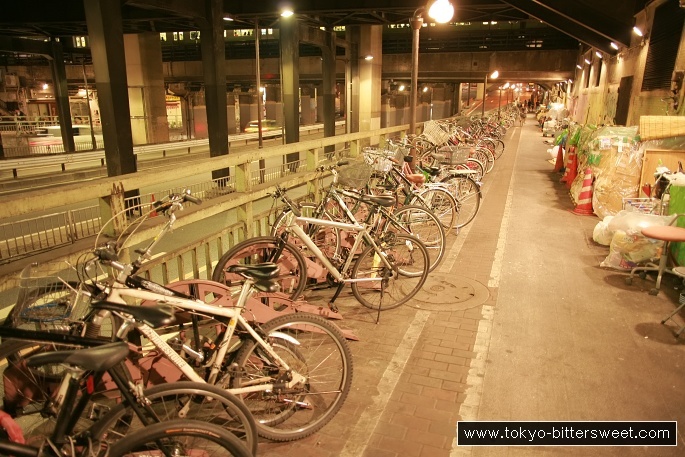 This picture was taken at the underpass at the JR Shibuya station and it shows bicycles parked in their parking clamps. Also note the narrow bicycle lane and the homeless colony on the opposite side.